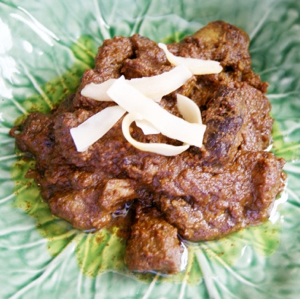 What is beef rendang? It's a common Asian beef stew — simmered in coconut sauce — that originated in Indonesia. This special treat still falls within my guidelines for a healthy entree. In the bowl of a food processor with the blade attached, combine the spices, salt, shallots, and garlic. Pulse until the mixture forms a paste. In a heavy large saucepan or Dutch oven, heat the oil for frying. Working in small batches, add the meat and brown well on all sides. Set aside. Add the lemongrass stalks and brown until fragrant, remove and set aside with the meat. Add the spice paste and cook until very fragrant and any liquid released has evaporated. Add the coconut cream or milk, and sucanat. Add the meat and the lemongrass. Bring to a boil, then turn the heat down to a slow simmer. Cook uncovered until the meat has absorbed the sauce, about 2 to 4 hours. Stir occasionally to prevent from sticking. When the sauce has evaporated, remove the lemongrass, slightly increase the heat, and fry the meat in the remaining fat. Reheat and serve with side of your choice, such as steamed vegetables, soaked rice, or our favorite: cauliflower "rice". This dish takes several hours to prepare since the sauce has to simmer down. Once the liquid is gone and the oil is left, you must watch it carefully so it doesn't burn. I recommend making it a few days in advance to allow the complex flavors to marry. *We like this dried lemongrass. **We like this coconut milk.